Distractions are everywhere. No matter how hard you try, you tend to entertain everything that is happening around you. It then becomes difficult for you to concentrate—but you can do some things to increase your focus if you want to. You get distracted because you absorb everything that you see and hear in your surroundings. It may be difficult for you to control your thoughts but you have to exert an effort to do so or else you will accomplish nothing. The trick here is, soon as disturbing thoughts enter your mind, immediately drop them and keep your focus on your work. Having a calendar of daily activities can motivate you to set your eyes on your tasks—one at a time. However, never forget to give yourself a break to prevent boredom and fatigue. More important, learn to prioritize. Do not multi-task (as much as possible). Multi-tasking is fine; it can help you accomplish a lot of chores for the entire day. However, this is not good for you if you are having problems with your concentration. 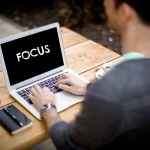 It is essential that you learn to set your attention on one task before moving on to another. Make your area conducive to working. Some people prefer to listen to music to be able to concentrate on their work. Some, however, choose to have a quiet environment. Know which league you belong to. If you are not expecting any call or text, it is also best not to have your mobile phone visible in your desk. It can distract you even if it is not ringing because subconsciously, you are expecting it to ring. Likewise, do not open your social media accounts while attending to your work. It can highly divide your attention and you are at risk of committing errors. Work on some exercises so you will have enough energy to accomplish all your tasks. Ask a gym expert or research over the Internet for workout routines that specifically help in improving one’s focus. It is also important to ensure a balanced diet. Do what you can do today; never procrastinate. Motivating yourself to finishing all your activities may lead to your 100% concentration. Perseverance is your key to become successful in improving your concentration. Never entertain any negative thought. Tell yourself that you can do it. More important, keep yourself away from distractions. This entry was posted in Alzheimer's, Blog, Chronic Illness, Health & Lifestyle, Home Life, Immune system on December 11, 2013 by Fredda Branyon.